Abstract: Interest in genome engineering of mammalian cells has been increasing in the past few years with the development of new tools to create DNA breaks at specific locations on the cell genome. Among these tools, the CRISPR (clustered regularly interspaced short palindromic repeats)-Cas9 (CRISPR associated protein 9) system has gained significant interest due to its relative simplicity and ease of use compared to other genome engineering technologies. The CRISPR-Cas9 system requires a complex of the Cas9 protein with a trans-activating RNA (tracrRNA) and a gene-targeting CRISPR RNA (crRNA) (Figure 1), or a single guide RNA (sgRNA, a chimeric form of tracrRNA with a crRNA). 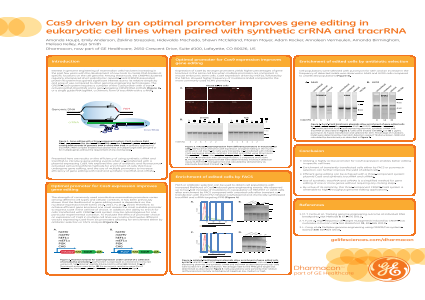 Presented here are results on the efficiency of using synthetic crRNA and tracrRNA to introduce gene editing events when co-transfected with a plasmid expressing Cas9. We explored the use of antibiotic and fluorescence-activated cell sorting (FACS) methods for enrichment of cells that have undergone gene editing, and the use of multiple promoters to increase efficiency of gene editing with Cas9 and synthetic tracrRNA and crRNAs. Summary: Presented here are results on the efficiency of using synthetic crRNA and tracrRNA to introduce gene editing events when co-transfected with a plasmid expressing Cas9. We explored the use of antibiotic and fluorescence activated cell sorting (FACS) methods for enrichment of cells that have undergone gene editing, and the use of multiple promoters to increase efficiency of gene editing with Cas9 and synthetic tracrRNA and crRNAs.References: M. T. Certo et al., Tracking genome engineering outcome at individual DNA breakpoints. Nat Methods 8, 671-676 (2011). Y. Fu et al., High-frequency off-target mutagenesis induced by CRISPR-Cas nucleases in human cells. Nat. Biotechnol. 31, 822-826 (2013).